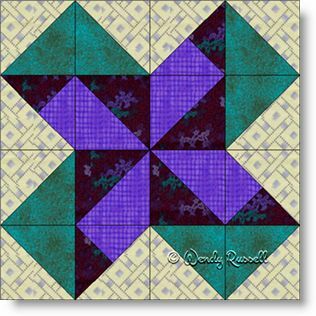 The Dancing Bear quilt block uses only half square triangles and a few quarter square triangle pieces that are disguised in the quilt block as three quarter square triangle patches. The three quarter square triangle patch is so named as there are only three triangles that make up the final square. However, there are two different sizes of triangles to make up the patch. This four patch quilt block can look very different depending on where you place the dominant colours in the block. Playing around with the colour value will make the difference in the focus of the patches. The sample quilts illustrated show a side-by-side setting of the blocks as well as a layout of the blocks "on point" with additional blank blocks to show off your quilting skills. The variations are endless.